"Jesus, what is your desire for our church; how do we build church?" These were urgent questions and constant prayers that moved me as a young pastor. I have been reminded again and again of two experiences in my life; Both of which had very little to do with my previous ideas of church. Amazing insights came to me when I started to read the Bible without the glasses of my previous understanding of the church . Insights that are still groundbreaking for my life and my ministry. If God is about to restore the apostolic mandate in our time, then a crucial question would be for sure "what is church?" Because: The church is built on the foundation of the apostles and prophets, and Jesus Christ is the cornerstone (Eph 2:20). 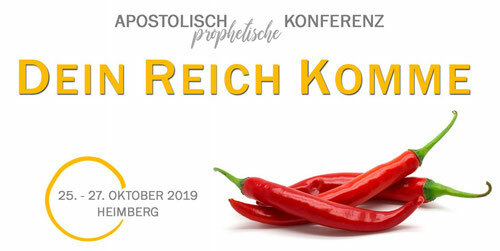 I'm looking forward to this days and I am grateful to have found next to Frans du Plessis with Martin Kaltenrieder a local speaker, who has been dealing with these issues for years. It is my heart's desire that the conference not only serves to shed light on these important issues, but that leaders will begin to support each other. "The church of Jesus is determined to be a place of heavenly power, where people get trained and authorized to be authentic followers of Christ in their daily challenges. This is the precondition for a transformation of our society. The body of Christ as powerfull manifestation of the Kingdom of God." Leader of Life Enterpris, Household of Faith in Durban, South Africa. He is a young, profound preacher of the Word of God. With prudence and tenacity, he surprises his audience and makes the Word of God a true experience. Frans du Plessis is married to Tory, and together they have three beautiful children. All those who are interested in this topic are cordially invited. Those in leadership will most certainly benifit from it. Please note, that the conference is not at the same town as last year! By public transport: with the train to Thun and then to Heimberg station, from there it's about 7 minutes to walk. Or from Thun station with the STI Bus Line 3 direction Heimberg until 'Laueligrabenweg' that's just in front of the venue. By car: Motorway A6 until exit no 15 'Kiesen'. Then follow the signs in direction to Thun until Heimberg, then follow the signs 'Aula'. The parking is next the Aula at the Schulhausstrasse or behind at the Ahornistrasse. German and English. English with German translation from the statge; Headset for German to English translation. There are collections made in the sessions. Meals and accodomations are for each individual's personal expense. The main meals areare for each individual's personal expense. For saturday noon there is the possibility to have a lunch at the venue - please registration for this. In the larger area there are some restaurants and places for shopping. At the venue picnic is possible and snacks and drinks are available. Accodomation is are for each individual's personal expense. children of all ages are welcome. The parents themselves are responsible for the care - there is no child care. The registration is primarily used, that we know how many participants are expected and that we can prepare the infrastructure accordingly.